Image caption EU chief Brexit negotiator Michel Barnier at a news conference after today's meeting on Article 50 in Brussels. Opinion is hardening in the EU against a lengthy extension to Article 50, Newsnight has learned. The EU is looking at making 22 May the definitive UK exit day with no further extension at that point, according to sources in Whitehall close to the talks. A key element in the EU thinking is that Theresa May will not give her support to a credible process to allow parliament to find an alternative Brexit deal. Brussels also has concerns about how future EU budget negotiations and trade deals would be conducted if a reluctant UK hung around in the EU. The prime minister is due to set out her request for an extension to Article 50 in a letter to the European Council president Donald Tusk. There was alarm among Brexiteer cabinet ministers after May reportedly failed to outline a definitive decision on her approach to Article 50 at Tuesday's cabinet. Leave cabinet ministers held talks at Westminster on Tuesday night to agree a joint position. Some cabinet ministers are expected to resign if the prime minister requests a lengthy extension to Article 50. The growing support in the EU for a short, rather than a long, extension of Article 50 to 22 May is designed to avoid rolling extensions. The new proposed exit date is the eve of the start of the European Parliamentary elections. Britain could not participate in the elections unless it passes legislation to do so by early April, something the prime minister had so far refused to do. Legal advice in the EU and Whitehall says that it would be inconceivable for the UK to remain in the EU without taking part in the elections. One source familiar with thinking in Whitehall says: "The EU is coming down against a long extension because it does not believe the prime minister will ever say: it is looking difficult for my deal so let's have a look at other options - a customs union or a referendum. The feeling is she simply will not change tack because in the end she always puts party before country." The prime minister is due to table an amendable motion in the commons on Monday to allow MPs to vote in favour of other Brexit options. This is not seen in Brussels as a credible process. 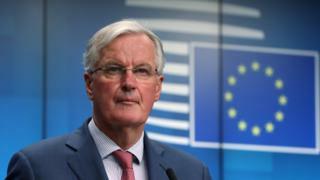 Sources familiar with the current thinking in Brussels say the EU believes it would be unwise to allow the UK to stay in the EU for an extended period when UK politics is "broken". One source said: "Yes they are hardening against a long extension on the EU. They just look at UK politics and say with such uncertainty why extend for long period?" A short extension, with a definitive end, is seen as risky in Whitehall because it could lead to a no-deal exit. But it could potentially help the prime minister pass her deal by presenting a final challenge to her party: support her deal or guarantee a no-deal exit. The EU's thinking on Article 50 could change in the run up to - and during - the EU summit on Thursday and Friday. Whitehall sources say the dynamic can alter when EU leaders sit round their giant table together in Brussels. A key moment in setting the atmosphere comes when the party groupings meet beforehand. The most important meeting will be the centre right EPP group which will be attended by the German chancellor Angela Merkel, the EU's chief brexit negotiator Michel Barnier, the European Commission president Jean-Claude Juncker and the Irish Taoiseach Leo Varadkar. Emmanuel Macron, the French president who has voiced concerns about a long extension, is not in the EPP group. Merkel, the most senior figure in the EPP, has been less hostile to a long extension.